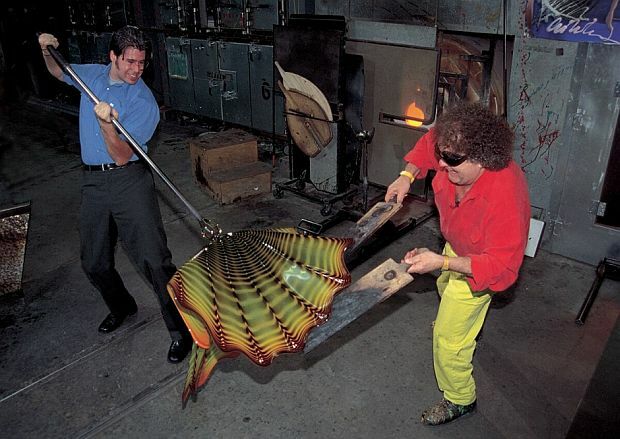 Allow contemporary American glass artist Dale Chihuly to shatter a few myths. The first is that glass, the medium which has made him world famous, collected by many of the world's top museums and coveted by an adoring public which can't get enough of his whimsical designs, is a dainty thing lacking in substance, shallow as a bowl. The second is that it's not art but a craft, useful more than innovative. But one at a time. A graduate of the Rhode Island School of Design who turns 75 this month, Chihuly is used to intense scrutiny of work defying easy categorization. Ever since blowing his first glass bubble in 1965, he has built a career on elevating the centuries-old practice of studio glass blowing to the level of fine art. Produced in his Seattle studio by teams of artisans who execute his designs from drawings on paper – a 1976 car accident left him blind in one eye so what he lacks in depth perception he gains in ideas – Chihuly's grandiose glass installations are exhibited in galleries and enjoyed in public gardens where the sturdiest of his pieces easily withstand the elements. More than vessels, they are undulating sculptures whose wafer-thin transparency catch light and cast shadows, heightening the visual drama. You don't drink from them: you devour them, the eyes feasting on their rich and rarefied beauty. But their magnificence doesn't always win people over. 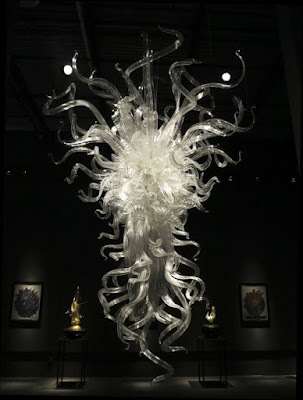 Mention the name Chihuly and opinions are often divided. A case in point is the Chihuly exhibition at the Royal Ontario Museum in Toronto that runs until January 2. 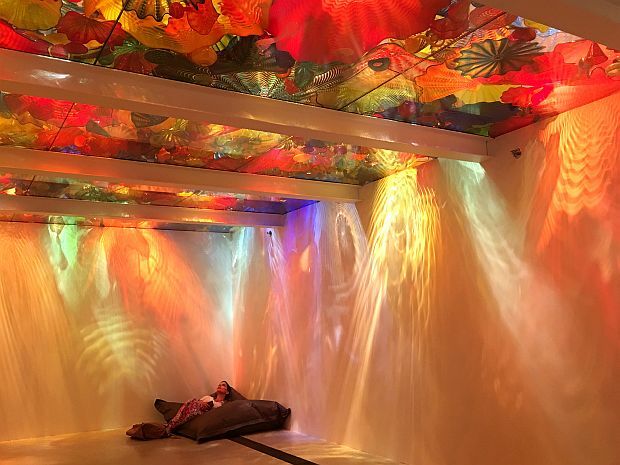 Consisting of 11 massive and immersive installations, the eye-popping show is the brainchild of Diane Charbonneau, the curator of modern and contemporary decorative arts at the Montreal Museum of Fine Art who organized Canada's first Chihuly exhibition in 2013. There, attendance was as strong as the reviews, the Montreal critics generally welcoming Chihuly's oversized glass extravaganzas with open arms. Toronto has so far proven to be a different story. While the fans love CHIHULY, as this one-man show is called, buying up scores of tickets and driving up attendance levels by word of mouth, the critics uniformly hate it, pronouncing the work flimsy in spite of – if not because of – its heft. Some have questioned whether his colourful and flamboyant creations can even be called art, challenging everything Chihuly has accomplished since he first began experimenting with glass techniques with the founding of the Pilchuck Glass School in Washington State in 1971. Comments excoriating the fact that the work is prolific, profitable and populist, made for the viewing pleasure of the public in mind, feel uncomfortably personal as well as wrong. Art, as anyone who has ever studied the subject knows, is a tangible good as much as it is an act of creative expression and audience experience. Its status as a commodity does not diminish or get in the way of its enjoyment. Or at least it shouldn't. 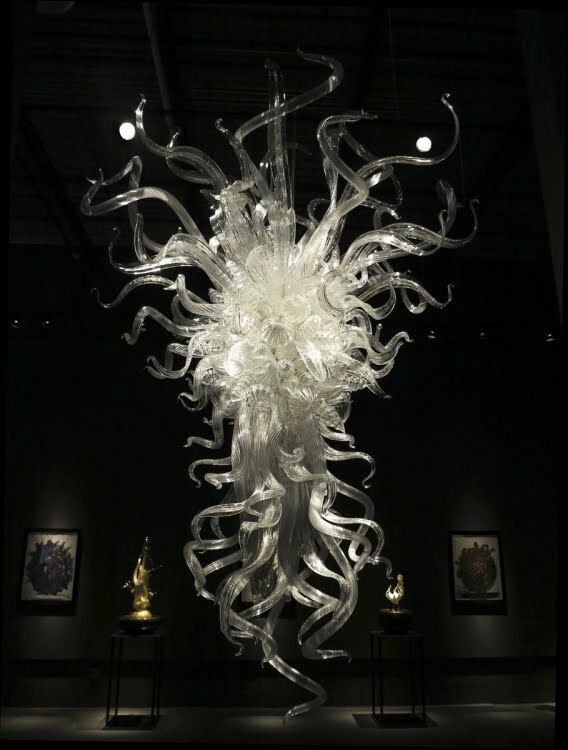 Critics who chastise Chihuly for simultaneously having work hanging in hotel lobbies and acclaimed museums like the ROM or the MMFA betray their inverted snobbery. Only the truly Romantic among us would call art made for public consumption a thing of lesser value than something made without a spectator in mind. But beyond its status as a commodity, Chihuly's work is inherently beautiful, also explaining its broad appeal. Mirroring the abstract patterns and designs found in nature, in particular flowers and sea anemones, and reflecting the colours of jewels, the glass seduces the senses, providing yet another sore point for critics for whom beauty is a byword for vanity and guile, an anti-intellectual pursuit. It's a limited point of view. Beauty, as the ancient Greek philosophers first observed, doesn't have to have a message. It has intrinsic value and is relevant for being sought after and valued in everyday life. "Dale's work is beautiful and pleasurable," says Sandra Ainsley, the Toronto art dealer who has been representing Chihuly for the past 28 years. "And what's wrong with that?" currently on display at the Sandra Ainsley Gallery in Toronto. It's meant to be a rhetorical question. But collectors at the Chihuly show that opened at the Sandra Ainsley Gallery in the city's east end earlier this week felt compelled to weigh in. Among them was Karen Sheriff, a retired business executive and former chair of the board of trustees for the Gardiner Museum in Toronto who came that night to buy, disregarding completely the critics. "His work is otherworldly," she remarked. "He can do scale in ways others just can't do. It's just incredible." dk: How is glass an art, in your opinion? dc: There is no other material that gives you colour like glass does. No other material has the ability to take in light and radiate out colour like glass. I have spent my life as an explorer searching for new ways to use glass and glassblowing to make forms, colours and installations that no one has ever created before – that’s what I love to do. Artists use many different materials to create their works of art, my material just happens to be glass – although I do work with other materials such as ice, water, neon and plastic. dk: Can you describe something of the process behind the pieces? dc: Everything I do is done quickly, and that's also the nature of glassblowing. The nature of the material – it likes to bend fast. It's got to move. I don't use a lot of molds or a lot of tools so it has a natural feel. I use centrifugal force and gravity and fire. I use those elements to shape the glass. Glassblowing is a very spontaneous, fast medium, and you have to respond very quickly. I like working fast, and the team allows me to do that. dk: All your museum shows are different. Why is that? dc: Every museum is different with different spaces available for me to present my work. Once I get a sense of the gallery or other areas of the museum available to me, which from time to time may include outdoor spaces, I am able to design the show to best complement those spaces. dk: How do you handle negative criticism? dc: I try not to let it overshadow the excitement and positive comments I get from the public and from the fans. That is what gives me the greatest joy and satisfaction. dc: Doing something new inspires me. Making something that has never been made before, something no one has ever seen, something with power that inspires everyone who sees it creating an unforgettable experience. That inspires me. dk: What do you hope is your legacy? dc: I hope my work and innovation will be my legacy. I hope how I’ve continued to push the medium of glass as far as it can go in terms of colour, form and scale will be my legacy. I hope the Pilchuck Glass School which I co-founded located in Stanwood, Washington – now considered to be an international center for glass art education will be part of my legacy. And I hope the credit that is bestowed upon me in elevating the perception of the glass medium from the realm of craft to fine art will also be part of my legacy. CHIHULY runs at Toronto's Royal Ontario Museum until January 2, 2017. The exhibit at Toronto's Sandra Ainsley Gallery runs until November 12.